Helga Winter, a turner known for working exclusively with green wood, is the subject of this month's profile. A symbiotic relationship with timber is of fundamental importance to her turning. 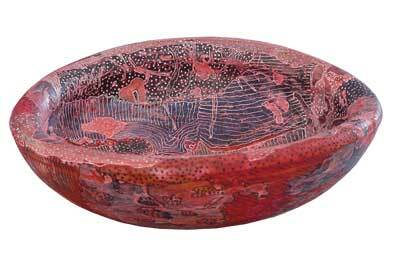 Helgaâ's approach and methods allow the 'life' in wood to influence the final form of her vessels and bowls. Madrone (Arbutus menziesii) and holly (Ilex spp.) are her timbers of choice. She discovered madrone by accident, but on first turning became "œenamoured with its ornery tendencies." As she explains: "I like the dance we perform. I turn a completely round shape; the wood takes its own shape back." As I spoke with Helga and came to understand her curiosity and need to experiment, this attraction to unpredictable woods made sense. Much of the enjoyment she finds in woodturning comes from "investigating and excavating the tree and working together by letting the vessel find its own shape during the drying process." She is clearly not an artist driven by the need to bend materials to her will. She tells me about her philosophy of life, of the importance of balance and the need to be attentive to what you do. This becomes apparent when you pick up one of her pieces - set it down and the narrow foot and uneven shape require your attention. Her gift to you is the unexpected stillness of the piece; you are rewarded with the vessel standing well on its own, despite the centre point appearing quite offset at times. Helga was born in Germany and moved to America as a young woman to study Education. She received her undergraduate degree in 1978 from the University of Texas in Austin, and her graduate degree in 1982 from Peabody College, Vanderbilt University, in Nashville, Tennessee. She followed these academic studies with apprenticeships covering furniture making, woodcarving and woodturning, and woodwork is not alone in her artistic skills. In 1986 Helga received an Individual Artist Fellowship from the Tennessee Arts Commission; Artisans on Taylor offered Helga her first show in mixed media paintings in December 2009; and in January 2010, she was an Artist in Residence at Centrum, Port Townsend, Washington State. She is currently pursuing both turning and painting. This November sees her return to Centrum where she will display 'From Tree to Treasure', an open-studio benefit show for the centre. 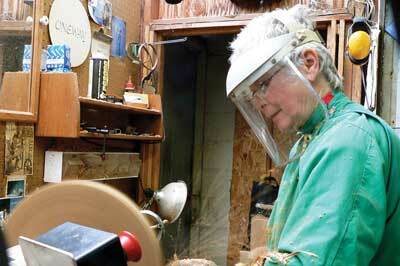 Helga discovered woodturning by chance while studying in Nashville. She walked by a wood shop with a Windsor chair and a Shaker chest in the window and was drawn inside. her career as a woodturner began. Helga's work has been included in both printed and gallery collections, including The American Art Company and Artisans on Taylor, both in Washington State; and The White Bird Gallery and Imogen Gallery in Oregon. Her essays and articles have been included in many magazines, in both English and German, and she has been invited to participate as a juror at some annual arts shows.On a personal level, Helga finds it rewarding to have people collect her work through all her changes in style and medium. As you would expect from someone with such an eye for form and design, Helga draws on visual elements from routines in her everyday world. "Nature in general inspires me. I am also influenced by events in my life. Walking on the bottom of the ocean - at low tide - the multitude of patterns I find there inspires me." It is obvious that her experience in turning informs her paintings: "When I started to turn in Nashville, there was a great variety of green and seasoned woods available; that made my display of turned vessels very colourful. At that time I simply oiled my work, making it functional. Moving to Washington State in 1987, I encountered mostly soft woods until, by accident, I saw a whitish looking wood in a waste dump, lugged it home and turned it. Madrone wood turns brown with age when oiled, so I have added colour and design to make up for all the colourful woods that I used to turn in Tennessee." Helga includes a quote from the Greek philosopher Zeno in the artist's statement on her website: "The goal of life is living in agreement with nature." I can't speak for her life, but she has clearly succeeded in this with her painted vessels. She is a philosopher-turner, aiming to achieve harmony and balance through working with her materials, allowing their natural form to shine through. Her respect for nature can be seen in all aspects of her work. She gathers seaweed and harvests timber herself, and uses every part of the tree: the trunk, the branches and the roots. She also makes use of trees that have been felled by storms, because of disease or for construction work. And today, with her reputation spreading, people leave salvaged local woods in her driveway and share stories about their trees. How do you describe Helga's turning style? 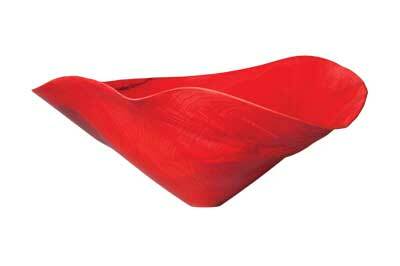 It is organic in a true sense - derived from or characteristic of living plants - but the wood is also Helga's canvas. The symbiosis in her turning works two ways: between the wood's form and her turned form, and between the wood's grain and her painterly skills. 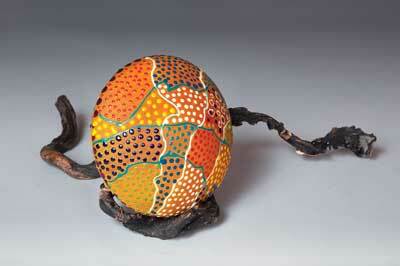 Two words that spring to mind when thinking about Helga's work are 'form' and 'colour'. Helga herself describes her style as 'free form'. 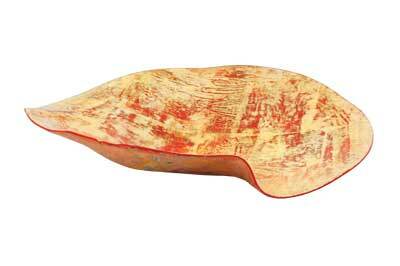 "I would say that discovering madrone wood and its instability changed my style. I now turn exclusively green wood - madrone and holly. 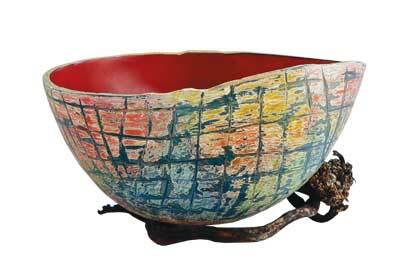 Mostly I turn thin-walled vessels that I embellish with colour and design. Turning green wood from start to finish allows the wood to take back its own shape after I have turned it into something completely round. Ideally I turn the vessel soon after I have chainsawed my blanks so that the wood contains a lot of moisture and the movement that occurs during the drying process can be extreme," she tells me. "My workshop," Helga hesitates. "Well, I have two. The workshop where the turning takes place is very small. There is room for a Oneway lathe, a grinder, a dust collector outside, tools along the wall and a bit of space to store some wood blanks. That is my 6 x 8ft space.And then I have a bright space where I finish my work, with a spacious workbench, running water, a place to make tea, ledges and shelves to display the finished work, as well as room to slowly dry the turned work," she tells me. This drying space is cool to allow the slowness required, and Helga wraps her pieces in paper and, if needed, plastic bags as well. A great many turners love their turning tools, but asked what tools she couldn't do without, Helga had this to say, which is a response that we have not heard before: "On tools that can be purchased I have nothing special. I have a chainsaw, a lathe, a grinder, a dust collector, gauges and an electric drill. The most important tool for me is the desire to investigate and excavate my life. That is what makes my work personal and keeps me inspired. The best thing about turning is looking inside a tree. "Following all we had discussed before, this did not come as a surprise to me. What she could do without is self-promotion. While she uses social media, along with gallery exhibitions, and newspaper and magazine articles, this is one tool she doesn't enjoy. Helga took copious notes of her painting techniques on wooden vessels when she moved to Port Townsend and discovered that putting her ideas and experiments on paper opened up greater possibilities. She comments that she has been spending much time contemplating the creative process of late. She has noticed that the surface treatment of her turned work is sometimes influenced by her two-dimensional work, and this is something she'd like to explore. She is considering teaching and discussing this process in the future. My top techniques would definitely have to involve my surface techniques, although they are so multi-faceted that explaining them would take up another article! 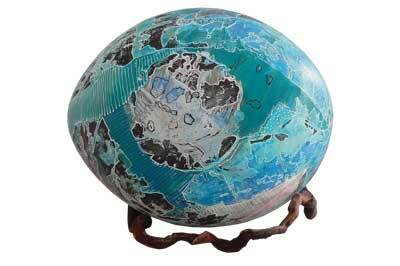 In short, I utilise wax-resistant dyes, acrylics, paper transfers, bleach and oils. I experiment a great deal with the various surface treatments I use. 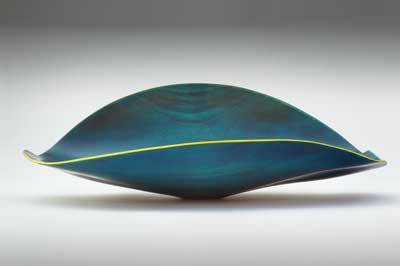 I take the shape of the turned object into account when I decide on the colour and/or pattern I will create. Most of the pieces I make receive several layers of patterns before I deem them completed.